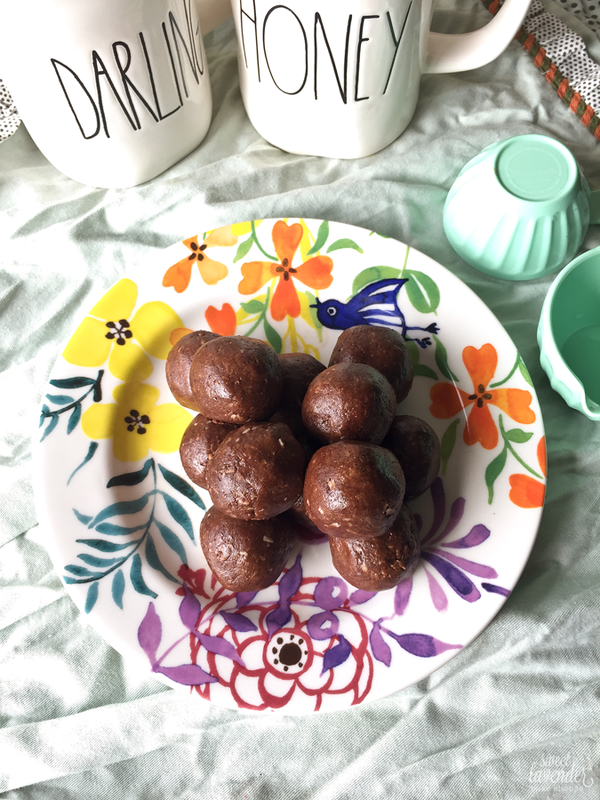 I wanted to call these post-workout snack bites, but to be honest, I've been making these and eating them any time of the day. They've been breakfast, they've been pre-lunch snacks, post workout snacks, even a little dessert after dinner. So, we'll just call them snacky snack bites, mmmkay? That probably doesn't work. These came out of the need to 1. have a little fuel after a workout and 2. have something I could easily grab and snack when I was ravenous in between meals. A snack which was healthy. Also one that wasn't leftover paleo Christmas biscotti or fudge. What I love most about these bites are how easy they are to make. My little guy loves to sit on the kitchen counter and help me dump everything in a bowl and "stir" it all together. Emphasis on the "" because honestly, half ends up on his lap and the counter at this moment in time. Teehee. Then when I tell him he can indeed reach in and grab some dough...and smash between his fingers...and eat raw?! Heaven on earth for him. He's constantly wanting to eat the raw cookie dough with egg, at this point and gets frustrated when I limit that. What can I say? Like mama, like son. I also love the tiny amount of sweetener used. So note, they're not extremely sweet. If you're looking for something more sweet, you can up your amount of honey to the 4 tbsp range, but honestly, they're amazing as is. Plus they're made with just really good, nutrient dense ingredients. Sunflower seed butter adds healthy fats and protein, but keeps things nut free for those with allergies. Raw honey is a great immunity and allergy helper. Plus its a nice unrefined sweetener. Cacao powder has mood-boosting phytochemicals, antioxidants, and magnesium. Flaxseed includes Omega-3 fatty acids to help support cardiovascular health and fiber to maintain proper digestive function. And coconut gives us a boost of healthy fats, vitamin A, vitamin E, iron and more fiber. Yep, these babies are that easy and that good. So easy a 22 month old can almost make them. 1. To a bowl, add all of your ingredients. Mix well. 2. Once combined, switch to your hands, to really incorporate everything until it forms into a large dough ball. It may seem a bit dry, but it should come together once you switch to mixing with your hands. If needed, add another tablespoon or so of sunflower seed butter, until it comes together into a ball of dough. 3. Using a tablespoon, spoon 2 tablespoons into your hands and roll and form into a ball. 4. 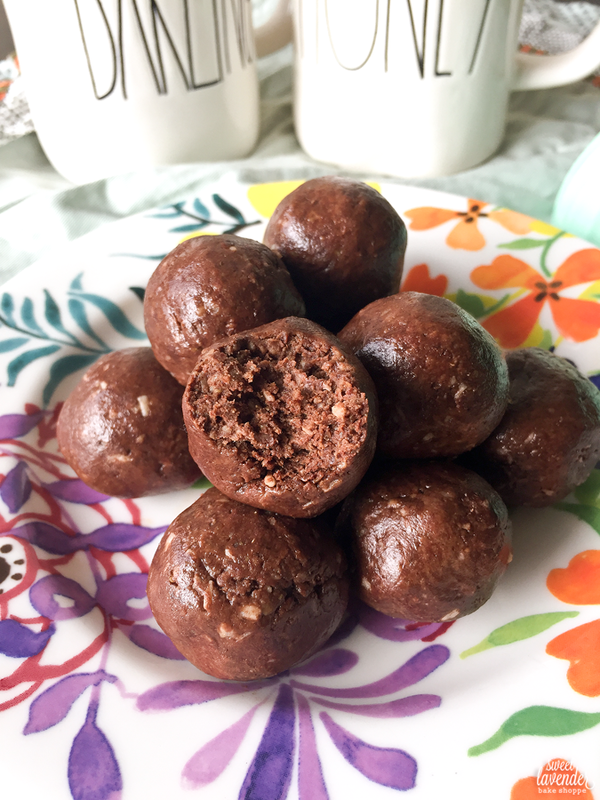 Place balls into an air tight container and chill in the fridge until firm. Enjoy! Keep stored in that air tight container, for 5 days. Yum, I'm excited to try these! Also, where are your mugs from? I've been seeing mugs and canisters like that all over Pinterest but I don't know where to find them! So excited you're excited to try em! So I got mine specifically from marshalls! Hope that helps! Can you use another milk to make the glaze? I don't like almond milk. Coconut milk or regular milk?